In early 1993 Steve Rowe decided to take Mortification on their most adventurous journey to date. 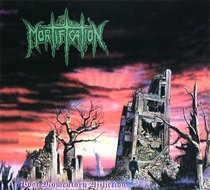 Post Momentary Affliction became Mortification's most acclaimed album in Europe, gaining the "Album Review of The Month" pick in Germany's Horror Infernal magazine. With bands like Pestillence taking Extreme Metal to more unique planes, Rowe dedided to follow suit with Post Momentary often being cited in the same sentence as the Pestilence Testimony of The Ancients release. Post Momemtary Affliction was a full swing towards bringing melody in with the brutality. Once again the band leaned more heavily on their Thrash and Power Metal roots, mixing these with the Death Metal and Grindcore elements. The sound of Rowe's 80's Power Metal band Lightforce came into the mix with melodic power riffing executed in brutal fashion. Utilizing many sound effects to join the songs, Post Momentary Affliction became an interesting musical journey showcasing different sounds and production for each song, and even presenting a bass and drum solo track titled "Flight of Victory". Such musical avenues seemed risky in a Metal world that looks for the lowest and most intense Death Metal. But the risk paid off, with many hailing Post Momentary Affliction as the band's greatest and most interesting work. Mortification toured the USA for the first time in 1993, playing to packed clubs and appearing at Chicago's Cornerstone Festival. Finally breaking into the US after years of touring in their home land of Australia saw the power trio enter the world stage.